Hello, girls! It’s October and time to get excited about all the fall goodness headed our way. Us, blogger gals live for this month. We get as excited for fall as we do the Nordstrom #NSale, Starbucks, and the perfect Instagram shot. Do normal people love fall as much as us bloggers do, just asking? Fall is pushing some amazing trends this season and I will be sharing those later this week on LLP! 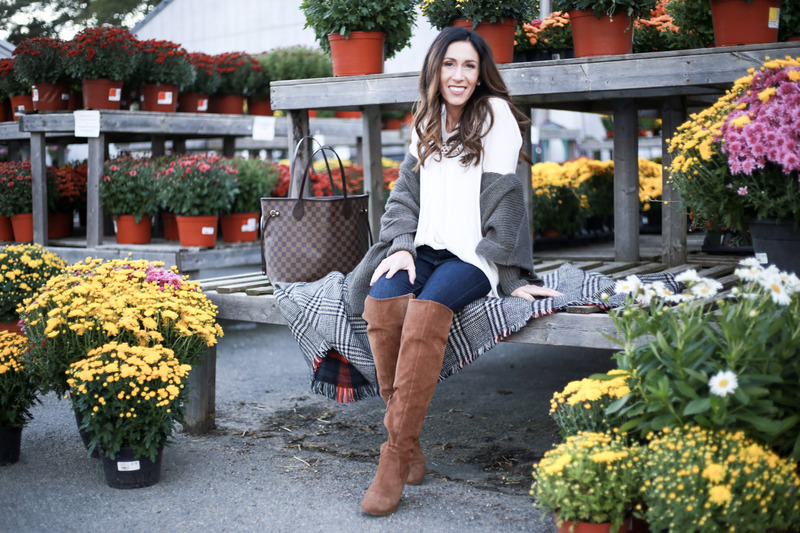 Today I wanted to share the 4 fall fashion staples that have been a constant must-have in my fall wardrobe and will be getting just as much lovin’ as they have the previous years before! First, let’s talk about those cozy knits, shall we! Can you really survive fall with cozy knits like chenille and cable knit? Chenille is everywhere this fall. My favorite Loft sweater that you all seemed to love is made out of it and I am obsessed. Wanted to take a minute to talk about this Chicwish tunic that has been on major repeat. It’s great for layering like I did under this cardigan. Every fall I add some new sweaters to the mix but the idea stays the same. I always reach for comfy oversized, and neutral. Cardigan or pullover these are a fall fashion must and are great for layering when the temperature drops. OTK’s are my jam. I love wearing them with skirts, pants or dresses. I’ll apologize in advance for a number of times I will wear them this fall. Everyone needs a pair, and they are certainly worth the investment. These are a shoe that never goes out of style. Julia Roberts in Pretty Women will always be the iconic black OTK imagine that pops into my head. They are great to wear with leggings and long cozy knits during fall. Scarfs, scarfs and more scarfs. I mean, really what did we do before the blanket scarf or any scarf for that matter? If you love your basics as much as I do, these are the glue to any great fall look. They are perfect for adding layers, pattern and of course style! Since I am always cold they are perfect for blankets or shawls. Stock up in theses, they are the perfect fall accessory! Fall fashion and floppy hats might be one of my favorite pairings. I remember a time when you couldn’t pay me to wear a hat, ask my mother! Now, I have to force myself to take them off. I love how effortless they are, and the hide 3rd-day hair which is also a plus! I know they aren’t for everyone, but go out and get yourself one. I promise you will love them in no time. Fall is my favorite season to dress for! These 4 fall fashion staples make me love it even more. Next week on the blog I will be taking fall trends, finding balance and the LBD that everyone needs! Let me know if you have any Q’s you would like answered, you can DM me on Instagram! Hope you had a great long Weekend & don’t miss all the amazing sales! *Thank you Chicwish for sponsoring this post. There are affiliate links. However, all options are my own.